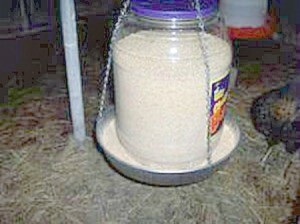 Buying a feeder for your chickens can be expensive, however with a few inexpensive items you can make your own. This is a guide about making a chicken feeder. Here is a homemade chicken feeder that my husband made. The store bought ones cost around $21.00 and this one cost him $3.00. It is made from a Cheetos jar and a dog pan that we bought from Wal-mart for $3.00 and some chain to hang it with and "S" hooks to attach it to the pan. What a brillant idea and very inexpensive to make! If anyone needs the directions on making this, please just send us an email or I can post it. Would live to get the directions for this! Thanks!